Rate this Article Get your comic fix with Comixology’s extensive database of old and new, digital comic books! Thanks to corporations like Marvel and DC Comics as well as to the massive anime boom radiating from Japan, comic books, graphic novels, and manga have taken the world by storm. What used to be the source of a nerd’s teasing has gone mainstream. There are now more ways than ever to read about your favorite characters whether you’d prefer it on your PC or on your mobile, but you may quickly realize that these sites or apps don’t actually have all of the comic books you want to read. There may be a select few and that’s about it. This is why the conglomerate Amazon has decided to set up a dedicated marketplace exclusive for comics, graphic novels, and manga. Dubbed as Comixology, a nice wordplay on the words, “comic” and “mixology”, this website features a wide range of comic books, graphic novels and manga, all in one neat and convenient place for you. Whether they are popular ones or indie (self-published ones), Comixology will have them stocked. Not to mention, the site even features original series like Secret Agent Deadpool, Beck, Grave Danger and Ask for Mercy. You can definitely have a fun time simply browsing the site and well… who knows? You might stumble upon a series you’ll fall in love with. Now, as the site’s a marketplace, many of the content on the site will require you to purchase them before you can read. 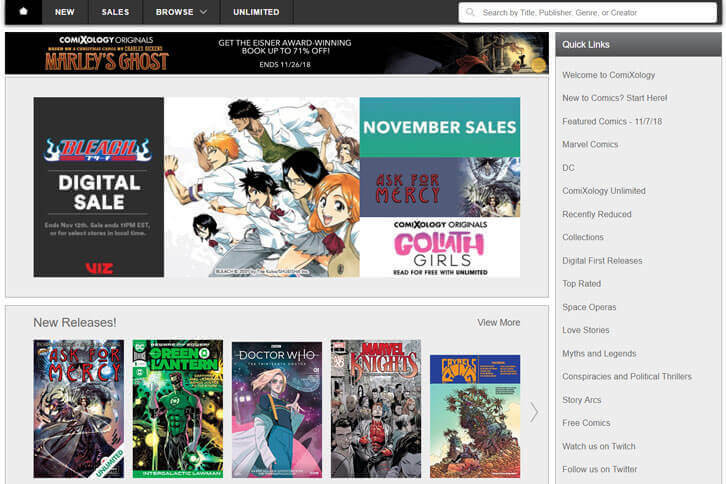 The site provides tons of exciting sales, series subscription and also bundles depending on your needs. You can even sign up to join the exclusive Comixology Unlimited membership. By being a member, you can read over 15000 selected comics, graphic novels, and manga for free – these items will be marked with Unlimited loge. You’ll get to enjoy special member sales and discounts as well, including a nice 10 to 15% off on all books from Marvel Comics, Image Comics, IDW Publishing, Dynamite and more, including those that were just fresh off the press, so to speak. Best of all, for the low, low price of $5.99/month, you can download any comic you’ve bought or have access to and then read them offline! These digital books are essentially yours to keep. Of course, for those who simply want to enjoy reading a comic or two, there are plenty of free comics available on Comixology too. So, if you’re looking for a website where you can enjoy the comic or manga series you love, Comixology is a great place to be. There is an insane number of comics, graphic novels, and manga here, including both old and new ones. Every purchase you make here are also linked to your Amazon, making it a whole lot easier for you to simply log in, buy and read!